As a fan of both "Arrow" and the original "Flash" show, I was pretty excited that a new iteration was coming, and I was especially excited to see what modern special effects would add. 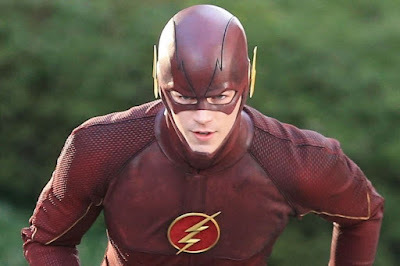 The original series did pretty good showing Barry Allen's speed, but today's effects really make a huge difference in bringing the comic hero to life. In a nice nod to the previous show, the original Flash (John Wesley Shipp) is also in this new show as Henry Allen, father to Barry Allen (Grant Gustin) A.K.A. The Flash. In this version of "The Flash," Barry Allen is transformed into a meta-human capable of great speed when a particle accelerator malfunctions and creates a radiated thunderstorm that shoots lightning into Barry. 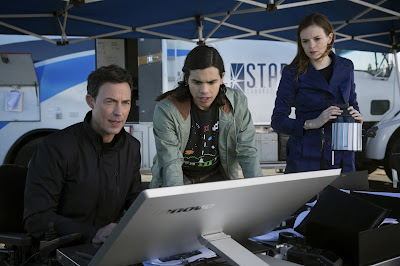 Barry is left in a coma and taken care of by the man who was responsible for the malfunction, Dr. Harrison Wells (Tom Cavanaugh) and his two assistants Caitlyn (Danielle Panabakers) and Cisco (Carlos Valdes). When Barry wakes up he learns that he has superhuman speed and he begins training with Dr. Wells to improve and control his new powers, while keeping his day job as a forensic crime scene investigator. It's not long before Barry begins to think about using his abilities to help people, but also his father who had been accused of killing Barry's mother fourteen years earlier. Barry's main goal is to clear his father's name but very few people believe him. 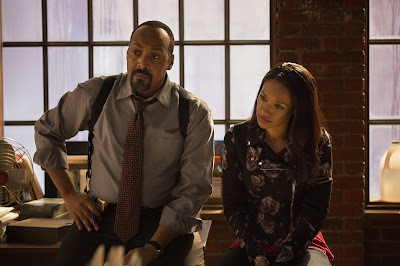 Other than the policeman Joe West (Jesse L. Martin) who took Barry in after what happened and his daughter Iris (Candice Patton), there's no on else who listens to Barry's protestations about his father's life sentence. Much of the show is spent on Barry trying to juggle his multiple lives and keeping his secret identity from being exposed, which isn't easy for him since Iris is fixated on The Flash and writes about him on her blog (and later for a newspaper) and he works with cops including Eddie Thrawn (Rick Cosnett) who also is in a secret relationship with Iris. Their relationship is troubling to Barry who has been in love with Iris since they were kids but he did nothing about it. That love triangle unfortunately plays a large part in this season which will appeal to some and annoy others such as myself. When it's discovered that the same radiation thunderstorm created other meta-humans like Barry, with each getting different powers of their own, the show picks up as it's always good to have some super villains on the loose. Much like "Smallville" before it, there's a lot of episodes where Barry will have to deal with some disaffected person that uses their new abilities to get revenge for slights against them. 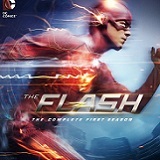 The better episodes deal with The Flash's main rogue gallery which include Captain Cold (Wentworth Miller), Heat Wave (Dominic Purcell), the Reverse Flash (whose identity is revealed near the end of this season), The Trickster (Mark Hamill reprising his role from the first series), the Weather Wizard (Liam McIntyre), and even Gorilla Grodd (voiced by David Sobolov). "The Flash" is a great show that appeals across the spectrum which is why it's so popular. There are very few shows that my wife and son and me can agree on. While I suspect that my wife likes the melodrama concerning Barry's angst and unrequited love with Iris, my son and I would be happy to skip all of those scenes. There's also a 99.9% chance that if there's a scene between Barry and his father, that one or both of them will be crying soon. I understand the reasons why the writers and all include those scenes, as they are trying to get audiences invested in the characters' personal lives as well as their superhero efforts, but I think the scale between the two shifted way too much to the personal side too often. For most guys, we want to see The Flash in action and when he isn't crying or moping about Iris, it's glorious to see. The special effects to show off his speed are awesome and there were many shots this season that seemed to have been pulled straight from the comics and brought to brilliant life. Several times, my son and I cheered some of those heroic scenes. It also helps that this cast is so well cast from Grant Gustin's inherent likability to Jesse L. Martin's continual excellence. I liked the villains as well and it will be interesting to see what happens next season. I have a feeling that the show will just get better and better, but I really hope that the showrunners drop the excessive melodrama as it really isn't' needed or wanted in a superhero show. "The Flash" is supposed to light and fun, so I hope that they let the show reflect that more. Episode 1: Pilot - Scientist Barry Allen acquires super speed through a freak accident and becomes known as the Fastest Man Alive. In the opener, Barry, a CSI investigator, is struck by lightning and awakens from a coma nine months later with the gift of super speed. Barry puts his new powers to work when another meta-human attacks the city. 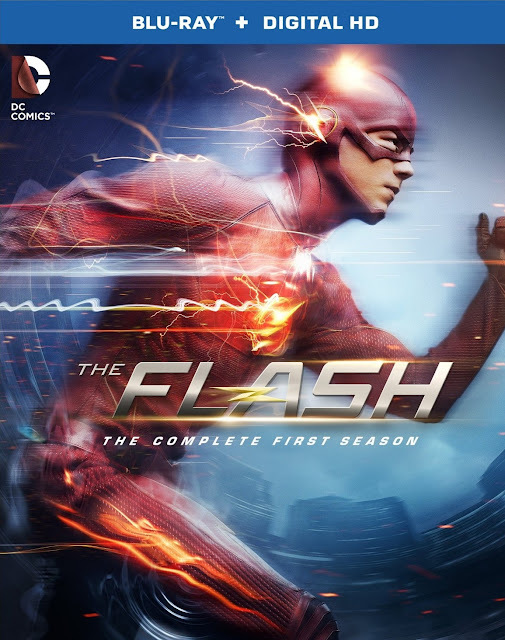 Episode 2: Fastest Man Alive - Barry changes into the Flash when six gunmen storm a university event honoring a scientist, but his heroics don't match up to his expectations. Meanwhile, Iris becomes even more intrigued by the "red streak. Episode 3: Things You Can't Outrun - Barry and the team go after the Mist, who possesses toxic gas powers, and they reflect on the night Caitlin's fiancé died. Meanwhile, Henry gets a long-awaited visit from Joe; and Iris and Eddie continue to keep their romance a secret from Joe. Episode 4: Going Rogue - The Flash battles Captain Cold after the villain is involved in a robbery and plots to steal the Kahndaq Dynasty Diamond. The evil plans get a boost when the Captain gets his hands on a stolen "cold gun" that could kill the Flash. Episode 5: Plastique - A bomb explodes downtown and the army, led by General Eiling, comes in and takes over the investigation, much to Joe's dismay. Meanwhile, Wells informs the team that Eiling experimented on his men to turn them into super soldiers; and Joe tries to get Iris to stop writing about "the streak." Episode 6: The Flash is Born - The Flash faces a new meta-human named Tony, who can turn himself into girded steel, but Cisco comes up with a plan to take Tony down. Meanwhile, Iris gets in trouble over her blog; Eddie witnesses Tony's abilities and asks questions that Joe doesn't want answered; and Joe asks Dr. Wells to help him solve Nora Allen's murder. Episode 7: Power Outage - The Flash battles Farooq (aka Blackout), a metahuman who can harness electricity. During their fight, Farooq siphons all of the Flash's electricity, which zaps him of his speed. Meanwhile, Tockman leads a coup inside the Central City police department and takes several people hostage, including Joe and Iris. 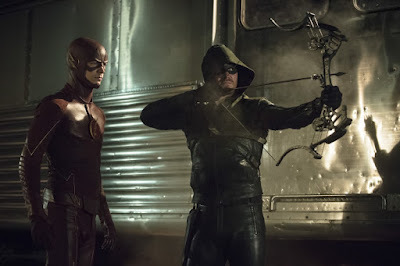 Episode 8: Flash vs. Arrow - A crossover event that concludes on "Arrow" begins with Barry teaming with Oliver Queen to stop a meta-human who is using his ability to control people's emotions to rob banks. Meanwhile, Eddie tries to get a task force to stop the Flash; and Caitlin and Cisco deal with a new team in S.T.A.R. Labs. Episode 9: The Man in the Yellow Suit - Barry finds the man who killed his mother, but soon discovers that his opponent is faster than he can imagine. He turns to Joe and Harrison for help trapping his opponent, but things don't go as planned. Meanwhile, Caitlin discovers that Ronnie is alive and enlists Cisco's help to find him, and Eddie asks Iris to move in with him. Episode 10: Revenge of the Rogues - Captain Cold and his hotheaded partner Heat Wave plot to steal a multi-million dollar painting and try to lure the Flash into a battle of fire and ice by kidnapping someone close to him. Episode 11: The Sound and the Fury - Dr. Wells' former protegee -- who can manipulate sound waves -- returns to seek revenge. Episode 12: Crazy For You - Cisco thinks about Hartley's dangerous proposition; Henry's snooping gets him into trouble. Episode 13: The Nuclear Man - Barry goes after Ronnie when he realizes Caitlin's fiancé is a dangerous meta-human who attacked a physicist. To track him, Barry visits Dr. Martin Stein who is working on a project called F.I.R.E.S.T.O.R.M. Episode 14: Fallout - An explosion separates Ronnie and Dr. Stein; Barry receives important information about time travel. Episode 15: Out of Time - Mark Mardon, also known as the Weather Wizard, targets Joe, who shot Mark's brother, Clyde. Episode 16: Rogue Time - The Flash learns that Captain Cold and Heat Wave have returned to Central City. This time Snart has brought along his younger sister Lisa to help wreak havoc on the city. 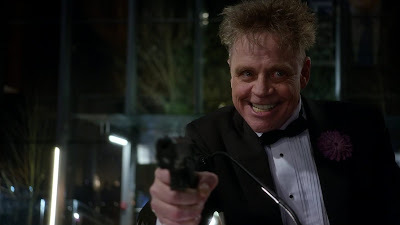 Episode 17: Tricksters - A copycat killer who goes by the name “The Trickster” starts setting off bombs in Central City. In order to stop the villain, Barry and Joe meet with the original Trickster, a criminal mastermind named James Jesse, who has been imprisoned for 20 years. Things quickly go from bad to worse when the Tricksters unite and take Henry Allen prisoner. Meanwhile, Iris asks Eddie for help with a case, and flashbacks show how Harrison Wells came up with the idea for the particle accelerator. Episode 18: All Star Team Up - Barry is surprised when Felicity Smoak arrives from Starling City along with her boyfriend, Ray Palmer, who flies in as the Atom. They’ve come to visit S.T.A.R. Labs as Ray needs help with his suit. Their timing turns out to be fortuitous because it's all hands on deck after a person named Brie Larvan unleashes hundreds of robotic bees to attack and kill her former co-workers, including Dr. Tina McGee. A group dinner with Barry, Felicity, Ray, Iris and Eddie turns into a disaster. Episode 19: Who is Harrison Wells? - Joe and Cisco head to Starling City to continue their investigation of Dr. Wells. While in town, the duo enlists the help of Captain Lance and Cisco meets the Black Canary, who asks him for a favor. Meanwhile, back in Central City, Barry races to catch a meta-human named Hannibal Bates who can transform himself into every person he touches – which includes Eddie, Iris, Caitlin and even The Flash. Episode 20: The Trap - Barry, Caitlin, Cisco and Joe set a trap for Wells, but it puts Cisco in grave danger. Meanwhile, Eddie makes a decision regarding Iris, which unsettles Joe. Episode 21: Grodd Lives - Reverse Flash releases Grodd on Central City to dristract himself from his own plans, and the telepathic gorilla abducts Joe. Episode 22: Rogue Air - Arrow and Firestorm aid the Flash when Barry reaches out to Captain Cold to help defeat Wells who then proves he can't be trusted. Episode 23: Fast Enough - Martin and Ronnie return to S.T.A.R. Labs to help the team as Barry must make a life-changing decision thanks to Harrison's machinations. This 1080p (1.78:1) transfer looks much nicer than it does on TV with a nice HD sheen that looks very similar to the previously released "Arrow" sets. There's a nice amount of detail present and the textures are nicely displayed. Colors look varied and bright and the black levels are fairly dark but not pitch black. There's no major digital defects to be concerned about. The Flash's DTS-HD 5.1 Master Audio mix is even better than the video quality with an active track that plays well to its hero's constant movement. I especially liked how the rear channels captured the atmosphere and how well the surround effects worked. Dialogue is crystal clear and the various audio effects sound fantastic. The score by Blake Neely also sounds great and well balanced. Commentary - We start off the set with a commentary on "Pilot" that includes executive producers Greg Berlanti and Andrew Kreisberg and DC Chief Creative Officer and writer Geoff Johns. Deleted Scenes - "Pilot", "Fastest Man Alive," and "Things You Can't Outrun." Deleted Scenes - "Power Outage," "The Man in the Yellow Suit," "Revenge of the Rogues," "The Sound and the Fury," and "Crazy for You." Deleted Scenes - "The Nuclear Man," "Fallout," "Rogue Time," and "Tricksters." Behind the Story: The Trickster Returns! - This almost nine minute featurette is great for fans of the original Flash series as we get to hear from both Mark Hamill and John Wesley Shipp who talk about their characters from the earlier show and how the show has changed for modern audiences. There are also clips of the original 1990 show that show the evolution of Hamill's Trickster character from one show to another. Since Hamill's Trickster was my favorite villain from the original show (and I'm a huge Star Wars fan), I really enjoyed this extra. Deleted Scenes - "The Trap," "Grodd Lives," "Rogue Air," and "Fast Enough." The Fastest Man Alive - At a little over thirty minutes long, this is the main behind the scenes look at the show. We learn about the history of the character and how he was adapted for television again. There's also plenty of interviews with the cast and crew of the show as well as the creators too. Creating the Blur: The VFX of 'The Flash - This is a surprisingly in depth look at the many cool special effects done for the show. We hear from the crew responsible for it all who take us through the process for the creation of the effects including how they make The Flash's signature lightning speed look so much like the comics. The Chemistry of Emily and Grant - This is Grant Gustin's screen test with "Arrow's" Emily Bett Rickards. 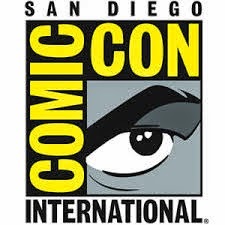 DC Comics Night at Comic-Con 2014 - This was a cool addition for me as I was present at this presentation when it happened. This one of a kind panel included the casts and creators from "Arrow," "Gotham," "The Flash" and "Constantine" which was really cool. For those of you that can't get enough of Stephen Amell, the audience even made him show off his abs which has been included here. Gag Reel - A quick look at the cast messing up and having fun with plenty of dancing included. "The Flash" is a fun show that is destined to get even better. While I wish it had less melodrama, I do love the action sequences and seeing the fastest man alive make the transition from comics to television. This Blu-ray has excellent video and audio quality and the extras are fantastic. This set is highly recommended!